(Last Updated : 23.06.16). Check DSSSB PGT Result 2016 Marks List & List of Shortlisted Candidates for PGT TIER-II Exam 2015. Earlier, Delhi Subordinate Service Selection Board (DSSSB) declared additional List of Shortlisted Candidates for appearing in PGT TIER-II Exam held on 28.06.15 for the post codes 184/14 (Physics), 133/12, 137/12, 142/12 & 149/12. Check DSSSB PGT Result, Marks List of Shortlisted Candidates, Document Verification Schedule of PGT TIER-II Exam 2015 & TIER-I Exam 2014. The board has declared PGT TIER-II Exam 2015 Result 2016 for the post of PGT for various posts and subjects like - PGT English, History, Commerce, Sanskrit, Urdu, Punjabi, Hindi, Physical Education etc. Candidates can check their result along with PGT Marks List of Shortlisted Candidates, Document Verification Schedule here at below link. DSSSB earlier declared Additional List of Shortlisted Candidates for appearing in PGT TIER-II Exam for the post of PGT Hindi, PGT English, PGT Maths, PGT Engg. Drawing & PGT Physical Education, PGT Pol. Science & PGT Sanskrit. DSSSB had declared List of Shortlisted Candidates for appearing in PGT Tier-II Examination for various posts of Post Graduate Teachers. DSSSB had given opportunity to all such eligible candidates of PGT TIER-I Exam who applied for both post codes of PGT of 2012 & 2014 to submit their representations upto 16.06.2015 to consider their eligibility for both post codes of 2012 & 2014 to appear in PGT TIER-II Exam to be held on 28.06.2015. All such candidates can submit their representations at DSSSB Reception Centre by 16.06.2015 positively. DSSSB declared List of Shortlisted Candidates for appearing in Tier-II Examination for the post of PGT (Maths, Hindi, History, Pol. Science, Economics, English, Sanskrit, Home Science, Commerce, Maths, PHE, Geog, Engg. Drg, Physics, Chemistry & Biology), PGT Agriculture (Post Codes 122/12 &123/12), PGT Music (Post Codes 143/12 & 144/12), PGT Urdu (Post Codes 155/12, 156/12 & 191/14) PGT Sociology (Post Code 153/12, 154/12), PGT Punjabi (Post Codes 189/14, 190/14) & PGT Painting (Post Codes 186/14, 187/14). 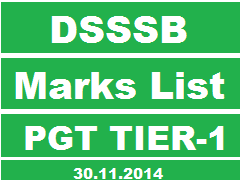 The Result & Marks List of PGT TIER-1 Exam held on 30.11.2014 for various posts have been released by DSSSB. Candidates who appeared in these exams can check result, marks and list of shortlisted candidates here. DSSSB released list of shortlisted candidates for appearing in PGT TIER-II Exam on the basis of the performance in the Tier-I exam held on 30.11.2014. DSSSB has shortlisted candidates for appearing in TIER-II Exam for the post of PGT Maths, PGT Hindi, PGT History, PGT Pol. Science, PGT Economics, PGT English, PGT Sanskrit, PGT Home Science, PGT Commerce, PGT Maths, PGT PHE, PGT Geography, PGT Engg. Drg, PGT Physics, PGT Chemistry, PGT Biology, PGT Agriculture, PGT Music, PGT Urdu, PGT Painting, PGT Sociology & PGT Punjabi for various post codes. You can view list of shortlisted candidates here. Download List of Shortlisted Candidates for PGT Engg. Drg. Download List of Shortlisted Candidates for PGT Phy. Edu. DSSSB released Result & Marks List of PGT Tier-I exam held on 30.11.2014 for the posts of PGT Urdu (Post Codes 155/12, 156/12 & 191/14) PGT Sociology (Post Code 153/12, 154/12), PGT Punjabi (Post Codes 189/14, 190/14), PGT Painting (Post Codes 186/14, 187/14), PGT Music (Post Codes 143/12, 144/12), PGT Agriculture (Post Codes 122/12, 123/12), PGT Pol. Science, PGT History, PGT Hindi, Physical Education, PGT Maths, PGT Geography, PGT Engg. Drawing, PGT Economics, PGT Commerce, PGT Chemistry and PGT Biology for various post codes..